The storm that walloped the Midwest in mid March was dubbed Ulmer by The Weather Channel, which led to historic and deadly flooding. 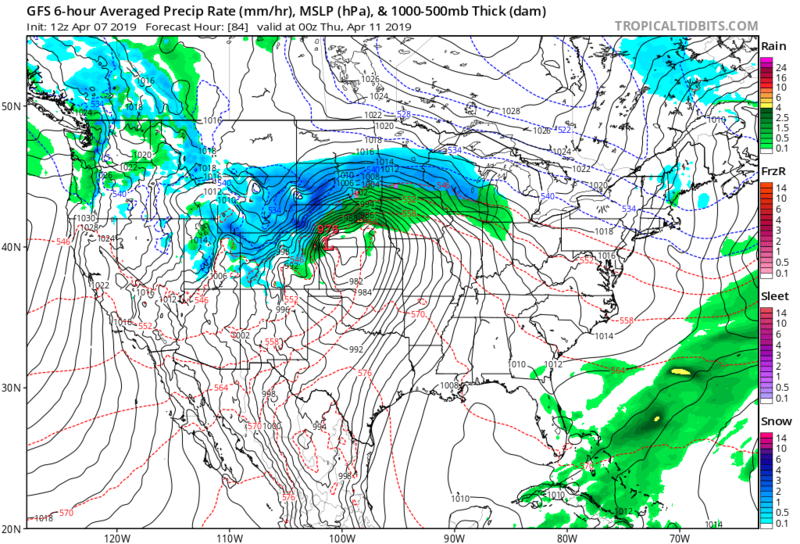 Heavy wet snow, as Jon alludes to, is likely from Wyoming eastward through the Dakotas into Minnesota. To be honest this system does not look too unusual for early to mid April meteorologically or climatologically. I only bring it up to point out that it will just add more misery to the Midwest, which did experience a climate change related event from a combination of a wickedly strong storm (Ulmer) and rapid snow melt left by a multitude of prior winter storms earlier during the year. Heavy precipitation was the real climate change footprint from earlier Midwestern storms. We will be watching for heavy precipitation from this coming one, as well. So in conclusion, even a typical “average to large” subsequent storm can compound the many sins of a prior climate change induced event. Nature can be very cruel. I will add more information about this storm in the next couple of days on this post.